Website monetization is the process of taking a websites’ visitors and turning them into revenue for the website owner. There are hundreds if not thousands of ways to go about doing this but the end goal is always the same – make as much money as possible. The internet is full of resources on how to grow your blog traffic, here at MonetizePros we’re more focused on making more revenue from each visitor. Here are 7 super common mistakes, or even sins, that may be stopping you from achieving your website’s financial goals. Although mistakes are great opportunities to learn – how about you learn from other people’s mistakes and save yourself a bunch of time, money and other resources? Webmasters and business owners always want everything to look perfect. The design has to be pretty, everything has to “fit together”. That’s the way the majority of people do it. Although it’s important to design your website in a way that you’re satisfied with it, or even proud of it. The true goal of it is to make it easy to use for your customers, look trustworthy and encourage sales. A lot of people follow this mindset and when putting ads on their site, implementing call to actions and lead magnets, they make everything blend in with the rest of the site. This means that you’re basically hiding the one thing that you want your customers to focus on, and more importantly, the one thing that will make you money. If your website is themed orange, like MonetizePros for example, your call to actions and ads should NOT be orange, but a color that will stand out in an orange environment (for example, cornflower blue). 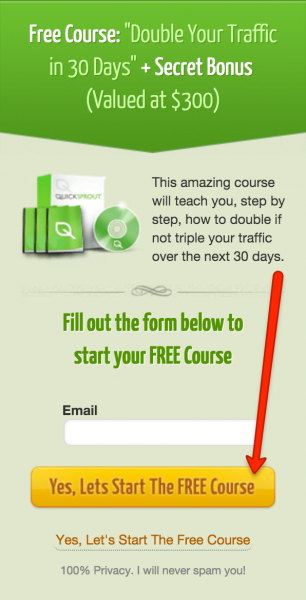 A great example of this is one of the call to actions on Neil Patel’s Quicksprout. The site itself is themed green, the lead magnet is green but the call to action button is yellow and grabs your attention. Keep in mind that this does not only apply to call to actions and lead magnets. This could be the color of your ads, the color of the links in your text, the background color of the images you use in your posts and so on. This mistake is a mix of getting more visitors to your site and making more money off each visitor. By collecting the email addresses of your visitors, you’re able to constantly send them back to your site by notifying them of new blog posts, new product launches or anything else you may think of. And keep in mind that your e-mail list is one of the few things that you truly own. Once you have their information, you’re able to get in touch with them at any time, for any reason – no one can stop you. Facebook fanpages used to be a great way of getting traffic but as they’ve demonstrated by decreasing the organic reach of posts – they’re in control of it, not you. If you’re ready to start collecting your own e-mail list, making more money and creating more value for your readers, check out our Ultimate Guide to Email Monetization. There are hundreds, if not thousands of ways to monetize your website, depending on your audience and niche. The majority of websites only use one – advertising. Advertising is a brilliant monetization method for some sites, but it’s horrible for a thousand others. Why? Because you’re getting paid (usually not a lot) to send visitors AWAY from your website, so someone else can make money off your work. It’s the equivalent of having a 9-5 job, compared to having a business. Now, I’m not saying you should NEVER use advertising. It’s a super easy way to get started with monetizing your website and it’s extremely profitable for a lot of sites. For example, look at TechCrunch, Mashable and so on. They’re huge content farms MADE for driving clicks to advertisers. The majority of these have a higher earning potential than traditional advertising and they can likely be combined with your current ads. Either find an alternative that makes you more money than display advertising or supplement it with one or several of the methods mentioned above. If you’re still certain that display advertising is the only way to go for you – consider cutting out the middleman and read our guide to selling ads on your website directly. Unless you’ve done this several times in the past, growing your site will be difficult process and take a lot of work. If you’re going to shift your priorities to money in the very beginning, that means less time for growing the site itself, making you less money in the long run. Don’t get distracted and focus on what truly matters. No matter how you’re monetizing your website, you’re not going to make money unless your readers trust you. Take your time and build a relationship with your audience. Create as much value for them as possible, with no strings attached and I can guarantee that it’ll pay off in the long run. On a website that is just starting out, you’re not going to make very much money. At the same time, you will be growing your business slower, scaring away some potential readers and for what? Consider the downsides and think about whether it’s worth it. When your blog is getting 120,000 readers a month, it’s probably too late to start effectively monetizing your website. The content and materials you use to grow your blog should always be supporting the monetization side of things. For example, if you reckon the best way to monetize your website in the long run is by creating an online course about email marketing, but you’ve grown your blog by discussing SEO, conversion rate optimization and so on.. Your audience will not be as targeted. Whereas if you grew your blog by discussing email marketing the entire time and then released a course on it, you can go back to all of your old posts and send highly targeted people to your new product. If you keep postponing the monetization of your webiste, you’re going to develop a fear of doing so and it’s only going to get worse. A lot of webmasters have this in their head – “what are my readers going to think “when I sell out”?”. Don’t overthink it, make a plan and stick to it. There’s nothing wrong with giving away your best content for free. That’s what we do with MonetizePros! But if you’ve spent several years only giving out free stuff, it’s likely that that’s the kind of audience you’re going to attract – people who want free stuff. It’s not a bad thing to charge money for the work you’re putting in – “train” your audience from the beginning and get them used to the idea that your content or product is worth investing in. Running a website has it’s own expenses. Besides all of the time and the opportunity cost invested in putting out great content, there’s also your domain, hosting service, email marketing service and other marketing tools that cost money. If you’ve spent thousands of dollars on a project with no return, it may get demotivating and you may quit entirely. If you’re looking to cut down your expenses – check out our coupons section for amazing deals! Website monetization is all about balance – how much should you give to your readers and what should you get back? When people start optimizing their website, whether it be with ads, sponsored posts or affiliate promotions.. They’ll often discover one thing. By placing more ads or offers, they’ll make more money. Seems like a nobrainer, right? Wrong. For every person that’ll be happy that you recommended them a great product and got affiliate commission for it, there are several that will be upset because you’re over-doing it. You might be killing the user experience for your dedicated readers and heavily distracting the ones that are on the road to becoming dedicated readers. 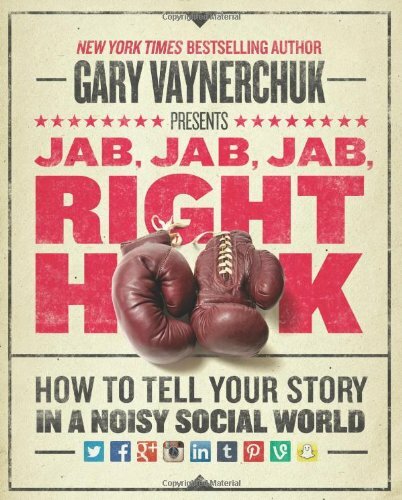 Gary Vaynerchuk has a great rule for this and has even written a book about it, called “Jab, Jab, Jab, Right Hook”. For every time you ask something from your readers (the right hook), there should be at least three times before that, that you’ve created immense value for them, with no strings attached (the jab). It’s a good rule to follow and the book itself is even better. If you’d like to check out the book, read the excerpts on Amazon and see if it’s your taste. Example of intrusive advertising on an Estonian news site. Zero content above the fold and 4 different ads. In the world of advertising, some companies are willing to pay you more money than others. What you’ll find is that having pop-up ads or very flashy GIF images in your sidebar may increase your earnings, but as always, there’s a catch to it. These intrusive ads will have a huge effect on the user experience of your site and make a lot of people leave the site. This will lead to people not taking your website seriously, people leaving your website and never coming back and may even have an effect on your Google rankings! No matter what you’re promoting, try to put yourself in the users shoes as well. Imagine coming to your website for the first time and trying to figure out what your company does or what you’re saying in an article. Look at it from a fresh perspective and see if there’s anything stopping you from doing this. Website monetization is all about a win-win relationship between you and your readers. To get them to buy something from you (or through your link), you really have to understand what their needs, problems and desires are. Your content and recommendations have to help them solve their problems and fulfill their desires. The better you know your websites audience, the easier it will be for you to make them happy and also make money off them. Can you answer these questions about your audience? Are the majority of your readers male or female? What age is your average reader? Do they have a business, job or are they a student? What do they already know about your industry? What problems are they looking solutions for? Are they willing to spend money to solve their problem? What type of content do they prefer consuming? There you go! The 7 deadly sins of website monetization. In case you’ve missed it, like we did, AdNgin publisher a similar article a while back – see it here. Now let’s be honest here – how many of these sins are you committing on your website? Leave your answer in the comments and I’ll help you. All good points, I have refrained from advertising until I set up monetizing on a service about to be released, I can see all the benefits of this articles. Just stick to your guns, will some small revenue enhance your web sites value, not really. Good list. The last one…not knowing your audience is probably the most overlooked one. It can impact not just monetization but also content creation. If you don’t know who you are creating the content for, you may not be very good at getting the right traffic. Thus leading to poor monetization. Very clear presentation with strong arguments. There are a lot of aspects which I have never think about and others of common sense. But all of them have been presented in a structural format and with proper examples of affiliate marketing and so on. Good stuff! Saws AdNgin’s write up with the same title but you totally killed it! Nice twist to the usual “list post”. Love how packed this article is, I guess most people never think website monetization is that difficult/complex.